Action on Sugar, a U.K. group of specialists concerned with sugar and its effects on health, did some research and discovered that many hot beverages available on the market today at places such as Starbucks and Dunkin’ Donuts are loaded with up to 25 teaspoons of sugar, which far exceeds the recommended amounts for daily consumption by the World Health Organization (WHO). This amount is triple what is found in a single can of Coke. The group looked at 131 hot flavored beverages and discovered that 98% of those sold in the U.K. had excessive levels of sugar. Similar sugar levels are found in many other countries, including in the U.S.
From vanilla lattes to numerous variations of hot chocolates, sweet hot beverages are popularly consumed by many Americans. In fact, 1.7 billion cups of coffee are sold every day, many of which are of the “indulgent” variety. Last year, WHO announced new guidelines, recommending that adults and children reduce their sugar consumption to less than 10% of their energy intake, and ideally to just five percent, which would translate to about six teaspoons of sugar. The worst drink reviewed by Action on Sugar is Starbucks’s Hot Mulled Fruit – Grape with Chai, Orange, and Cinnamon in their Venti size (the largest size they offer), which came in at whopping 25 teaspoons of sugar! 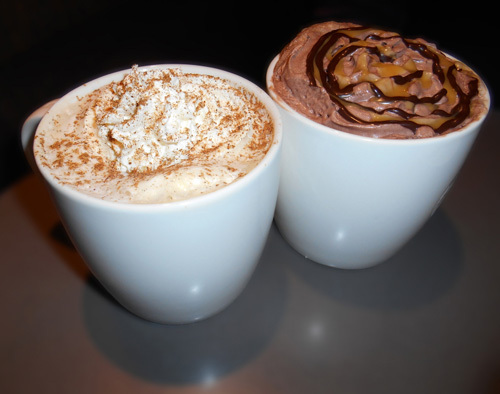 The second and third worst drinks to consume at Starbucks were the White Hot Chocolate Mocha with whipped cream (Venti, 18 teaspoons of sugar) and the Signature Hot Chocolate (Venti, 15 teaspoons of sugar). When asked about the levels of sugar found in their popular hot beverages, a Starbucks representative said they are aiming to lower the sugar content by 25% by 2020. Overall, Starbucks does sell sizes that are larger than what’s considered average at other cafés, and this certainly contributes to the high amounts of sugar per drink, but even a drink like their Classic Chai Tea Latte (Venti), which is perceived by customers as a healthier option, has 13 teaspoons of sugar in it. Lately, more campaigns against the excessive sugar content in our food are popping up and gaining momentum, but at the end of the day, it’s up to consumers to make wise decisions. “Shocking amount of sugar found in many hot flavoured drinks,” Action on Sugar web site, February 17, 2016; http://www.actiononsugar.org/News%20Centre/Surveys%20/2016/170865.html. “WHO calls on countries to reduce sugars intake among adults and children,” World Health Organization web site, March 4, 2015; http://www.who.int/mediacentre/news/releases/2015/sugar-guideline/en/, last accessed February 17, 2016.